I'm not sure where this year is going and I can't believe I'm writing a post about “8 Things on My Winter To-Do List. I had so much fun writing this post last year. That I thought it would be pretty cool to write this list again this year. I'm always the one behind the camera and not in front of it. I really do not have any excuse to why this is always the case especially with a DSLR camera, tripod, and remote. I really have to step out of the box and really make this into a reality. I would love to have a really nice photo shoot with tons of cute photos. I have the perfect Valentines Day DIY setup idea. I was thinking about using a gold sheer curtains as the backdrop and me holding a dozen balloons with confetti falling from the sky. How cute right?! Last year I had this on my list to visit Rockafeller Center to see the Christmas tree and I never did. Not sure why. I would love to visit though. Even though I don't like being outside in the cold. I think this would be a really nice experience in one of my favorite cities. I still haven't been to a professional football or basketball game. We do not have any professional teams in my state if I could use that as an excuse. However, it would be nice to watch a game on a whim. OK, so I'm not about to sing the whole song. However, I do have the tunes playing in my head. Ha! We have an ice-skating rink that I think would be pretty cool to go and visit. I can skate, a little. So I'm not sure how well I'll do on the ice in the cold. But it looks like fun. I want to bake, spend an entire day baking or at least the early parts of the morning. Trying all of the recipes that I've wanted to try for the longest. I would love to make homemade caramels and truffles. I would also like to include a couple of healthy treats as well. I purchased my silhouette machine two years ago and I feel as if I never really don't make time to create. It would be really nice to sit and create all of the things that I pinned on Pinterest or at least some of them. Not sure what has been going on with me this year. However, I never really take out the time to read. I was doing so good with this, and of course, I started off the year strong. However, I really struggle with taking the time to read and just unwinding. I would like to complete at least one book this winter. This is so long overdue. I would love to escape and go to a beautiful place this winter. In or out of state. We have so many beautiful places in Connecticut and the surrounding area that I would like to take full advantage of visiting. 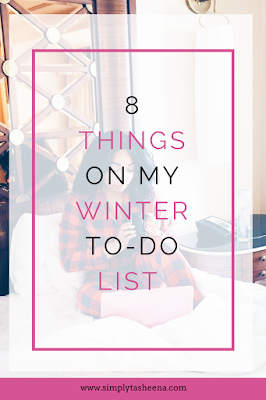 Do you have a winter “To-Do List”? Good luck with your list. It sounds like fun! I hope to get a lot of reading done too. And eating a lot of cookies. This sounds like such a wholesome to-do list. I'm from Australia, so we're currently coming in to Summer, but I would still love to go ice skating at an indoor rink - what a great way to get out of the heat and have some fun! I've seen the Rockafeller tree in movies and it looks so magical! I'd love to see it some day! We have winter to do list in common. Staycation and Baking are the two things I'd like to achieve and do over this winter season. You should definitely do the ice skating thing! I love to go ice skating and the weather is getting colder here too! My to-do list for winter is way too long! But like you even I have baking in there, going to try some healthy recipes. What a great idea! I have my to do list sorted for my business (www.nottonhouseacademy.com) but not for me personally yet - off to the drawing board! thanks!